Max reveals and discusses his favorite tabletop, digital, and mixed media games of 2015 - why they're awesome, why you should play them, and why they represent progress to the field of games as a whole. Pandemic Legacy is a tag team effort between designers Matt Leacock, of the cooperative board game of disease control, Pandemic, and Rob Daviau, inventor of the concept of "legacy" board games pioneered in Risk Legacy. It is published in the U.S. by Z-Man. If you don't know what a legacy game is, here's the gist: it's an otherwise fairly traditional board game that over multiple plays evolves by adding mechanics and persistent elements. You're supposed to play with the same group for a set number of games (12-24 in Pandemic Legacy). Legacy games are NOT campaigns... the next game doesn't pick up where the last left off - instead it restarts with a small number of changes. Some of these changes are predictable: at the end of each game of Pandemic Legacy, for example the players can choose to add permanent research stations to the map, upgrade one of the characters, or research to make the diseases easier to cure. Other changes are surprises: under certain circumstances the players are instructed to open sealed boxes that often contain new rules to be stuck into the rulebook, new components to go along with the new rules and stories that explain both. Because much of legacy games is hidden, I want to stress that this is a spoiler free discussion of Pandemic Legacy. I love Pandemic Legacy for a lot of reasons. For one, the legacy model is just amazing at scaffolding; the game takes basic Pandemic and adds more and more complexities that would be extremely imposing if you were learning them with the base game, but they're added in slowly so that the player is like the proverbial frog in boiling water. 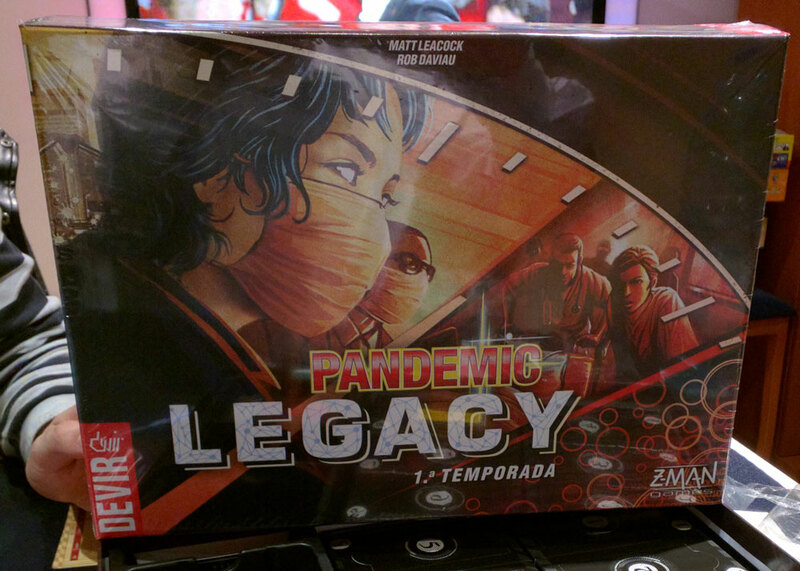 Pandemic Legacy uses the legacy model even better than its predecessor (Risk Legacy) to build progression and investment in the game, likely due to its affordances as a cooperative game. One example of this: Risk Legacy as a competitive game allows (and often highly incentivizes) its players to change factions each play-through in order to control for balance. In both of my Risk Legacy playgroups none of the players really wanted to do this. As a cooperative game, Pandemic Legacy solves this problem. Even though you can switch characters, my playgroup has grown attached to our characters and have done so minimally - and since the game is cooperative that's our prerogative. 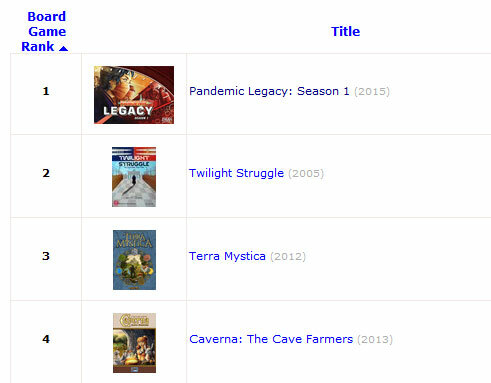 Pandemic Legacy's presence on my list isn't a surprise. It's currently the #1 rated board game on bgg. I promise the other games on this list will be indie gems. 1. One of the diseases has mutated and is now harder to cure... replace its tokens with these new tokens. 3. Now there's a new character - and she's the sister of this previous character! Use these stickers to indicate that they are family members! Pandemic Legacy is a mechanically excellent game that takes storytelling in board games to new heights. It's totally worth its $70 price point (especially split 4 ways), so I highly recommend getting your group together and saving the world! I first saw Crypt of the NecroDancer at PAX East 2015 and didn't spare it a second glance: "oh another dungeon crawler," I thought as I continued on my way to the tabletop section. But when my friend the estimable Laura Michet recommended it (and when it was free to play on Steam for a weekend) I played it and fell in love. Roguelike games have permadeath and are about repetition. Usually you're piloting a character going deeper and deeper into a dungeon, and your character is getting more and more powerful. When you die, however, that's it... you must restart. 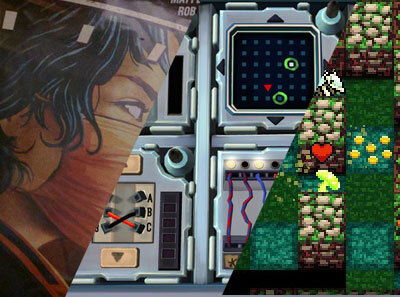 Roguelikes focus on you as the player getting better. With a few notable exceptions, you carry over nothing except your own skills from run to run. In this way I find roguelikes very similar to board games, since you start from scratch each time, bringing only your own practiced skills to the table. Roguelike games are about strategy. These games often front load a lot of decisions: what character class or classes are you going to play? How are you going to attribute skill points? This is part of the appeal, since because you restart so often you get to try all sorts of different strategies/builds. Again, this is reminiscent of board games. 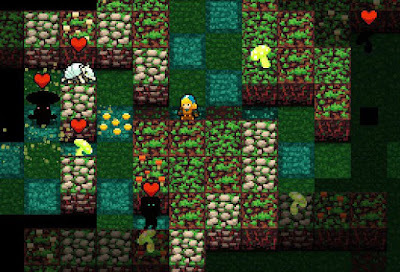 Roguelike games are turn-based and tile-based. Typically you and your enemies alternate "turns" in which you move, attack, or use a skill and then all of your opponents move or attack. These games also are usually on a giant grid (like a Chess board), where moving moves you one tile. These features make roguelikes extremely tactical, often putting the player in puzzle-like positions where they have to figure out "if I attack the enemy directly above me, the enemy directly below me will hit me. If I move left, the enemy below me will be stuck behind a wall, the enemy above me will move above me again, and then I can kill them both without taking damage." I love Crypt of the NecroDancer because unlike gratuitous genre mashups where the designer clearly thought, "You know what would be cool? Pokemon except instead of choosing moves you played Candy Crush" (Puzzles & Dragons) the designers of Crypt of the NecroDancer found a way to add rhythm into roguelikes that makes both mechanics more awesome. In Crypt of the NecroDancer you're Cadence, a badass heroine who is descending into the eponymous crypt to rescue her father. The brilliant part of the game is while in the NecroDancer's dungeon, both you and the enemies can only do anything (move, attack, cast spells, reload weapons, etc.) on the beat of the game's excellent music. As you descend further into the dungeon the music gets faster (and changes genre), making your knowledge and muscle memory of how to deal with enemies more and more important. One fundamental problem of traditional roguelikes is the analysis paralysis issue: in order to succeed, you'll want to take lots of time to think over every move you make, but doing so isn't that much fun. NecroDancer solves this problem by replacing turns with beats, which provides the best of both worlds. The game retains the tactical planning of traditional roguelikes while eliminating the potential for overthinking any particular move. All of this results in an extremely well-designed experience that makes you feel like Cadence is actually dancing (well, dance-fighting) with the monsters in the crypt. I often find myself complaining about how repetitive and unadventurous our media tends to be. "Oh look, another FPS game. Just what we needed, another Star Wars movie. Yay, a Kickstarter for another worker placement board game," I'll whine. When this happens I try to catch myself, because I know why this happens. On the creators' sides, it's orders of magnitude more expensive, risky, and challenging to make media that really pushes boundaries. On the consumers' sides, nostalgia and familiarity are extremely powerful forces to be overcome; I've found that game designers tend to want novelty and innovation way more than the average player does. Crypt of the NecroDancer treads the fine line of making something entirely new from familiar parts, and it succeeds spectacularly. Unlike the other games in this blog, Crypt of the NecroDancer isn't pushing the boundaries of gaming. Instead, I think it's doing an amazing job of filling the unexplored gaps that exist within the current boundaries of gaming. Crypt of the NecroDancer is, in my opinion, the pinnacle of rhythm games and roguelike games. Between its awesome mechanics, cool story, fun writing, excellent level design, and clever multiplayer competitive and cooperative elements, there is no reason you shouldn't be playing this game. Keep Talking and Nobody Explodes is a Steam game that's unusual in that it's a 2 player game in which only one player uses the computer. 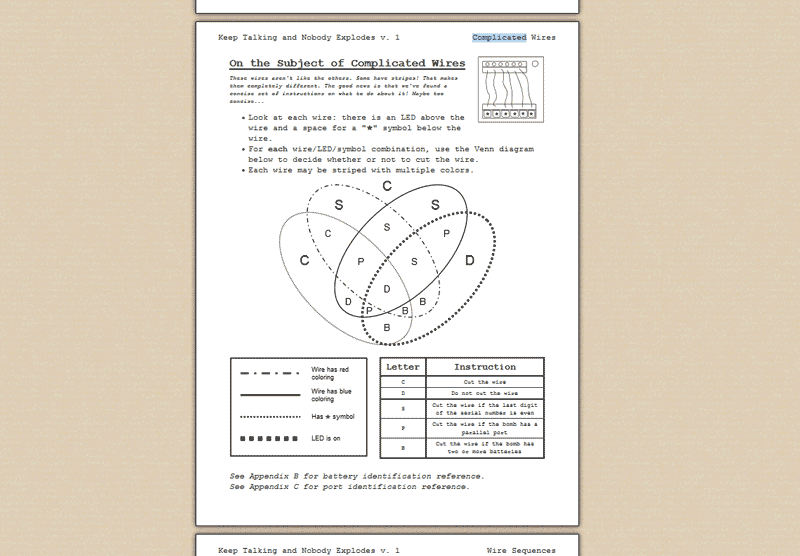 Keep Talking is a cooperative game where one player is playing on the computer trying to disarm a bomb, and the second player sees only a printed manual and tells (yells at) the first player about what to do. Tip: if the button says "HOLD" you almost always don't want to do that. Almost always. Each bomb is comprised of a number of modules, each of which must be disarmed so that the bomb can be defused. The problem is that modules require a lot of information to disarm, often referencing large charts, complicated graphics, or simply long lists of if-then clauses. For example, to disarm the module in the center bottom of the bomb shown above, you'll need to figure out where each wire lies on the graphic below from the manual and cut only certain ones to progress. I'm classifying it as 'beyond digital and tabletop' because Keep Talking is really two games in one package: one player plays the mostly-digital communication game of inspecting the bomb and telling her ally what he needs to know about the modules (while making sure time-dependent modules such as the discharging capacitor don't set the bomb off), and the other player plays a completely nondigital speed reading/reading comprehension game of interpreting a manual that is written to be obtuse. The sum of these parts results in a game that feels neither like a video game nor like a board game, but has elements of both. 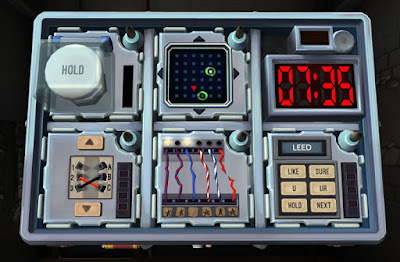 I love Keep Talking and Nobody Explodes because even with no story and very simple and limited graphics, it manages to make me feel like I'm actually defusing a bomb. Keep Talking also fills a rather empty niche in games: a party game (or 'your friends or family are over and you don't know what to do with them' game) that you can play on a PC - usually I'm resigned to bringing out the cards games or console games when friends come over. But beyond the theme and the market niche of the game, Keep Talking's mechanical design is simply stellar. The level design is solid, the range of modules is tantalizing, and the writing is excellent. 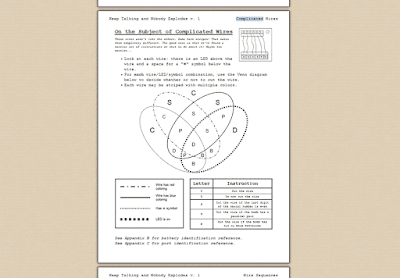 No, I'm not talking about the narrative again, I'm talking about the mechanical and aesthetic design of the manual: the manual sections for most modules look and read like they're straight out of some technical specification, and the methods of disarming each module are varied, challenging, and hilarious. The aptly named "Who's on First" module, for example, challenges the bomb-defuser to communicate what words are on which of six buttons, and the manual-reader must cross reference those words and button positions through various tables and then communicate back which button to press. The hilarity ensues when the manual reader realizes (often too late) that his partner said that the button ready "YOU ARE," but he looked in the column for "U R," or (my personal favorite) when he said "BLANK" he meant to press the word B-L-A-N-K and not the blank button. Keep Talking takes novel mechanics and combines the best of the digital platform (real time, immersive graphics, sound, animation, etc.) with the best of the tabletop genres (multiplayer communication, face to face with your friends) to make something wildly new and wonderful. Playing Keep Talking and Nobody Explodes reminds me tremendously of the experience of The Hearst Collection at Come Out and Play (which I wrote about here), which is a real-space game of dodging between lasers to retrieve a painting without setting of alarms. I found The Hearst Collection transporting and immersive, and if you had asked me at the time if I thought any game played solely on the table or solely on the computer could be as transporting, I would have said that it was impossible. I'm happy to say that Keep Talking proves me wrong and succeeds in packaging an immersive, challenging, and hilarious experience in a game that you can download on Steam. If you're looking for something to play, be it tabletop or digital I hope you've got some ideas now. With luck, game developers in 2016 will push as many boundaries as they did in 2015! Always a joy to read, Max. I really want to try "Keep Talking and Nobody Explodes" now, it looks like a great time, probably even for observers. "On the consumers' sides, nostalgia and familiarity are extremely powerful forces to be overcome; I've found that game designers tend to want novelty and innovation way more than the average player does." Is it a desire to be pioneers? For designers to make a name for themselves? I tend to think it carries a similar mindset as entrepreneurship where "disruptive innovation" is the quickest way to a competitive advantage. This is as opposed to digging into mature product offerings on the market and understanding their limitations so one can iterate and create a better version. In the right hands disruptive innovation can lead to the iPod, a product that opened minds and created new needs. In the wrong hands, innovation can turn into the Segway; the solution that never found the right problem to solve. I'm not 100% convinced that every designer who strives for innovation is for a competitive advantage. While I'm sure that's the case to some extent (although I can see it being even more of a motivation for publishers who are publishing new mechanics and structures), I think that demographic probably plays a big role. In my experience, creators tend to be more well versed in their medium than the average consumer. This is likely even more the case in board games because so much of the growing player base is new to the hobby. That means that a game that I see as using tried-and-true design elements, a random player is fairly likely to have never played something like it before. I can't speak for every designer, but my designs usually come from a place of "I would like to play a game like X, but it hasn't been done before..." Does that ring true to your experience, or is it just me? I think you nailed it; originality can be rewarded in the pursuit of being picked up by a publisher and that is where some of the motivation stems from. Some can also come from the greater familiarity a creator has; if they're going to create, they may as well innovate. Designers can be sensitive to criticism surrounding "oh, you just used mechanic X from that game" which can either be dismissive of one's work or elicit paranoia of plagiarism (this can be a real fear in new tabletop designers). I share your perspective on your last question. I'm always tempted to tweak a rule or try a variation in published games, so I guess it shouldn't be surprising that I do it in my own creative projects. I'd dare to guess there are comparatively fewer designers with the "I want to revolutionize the world of design with the next great idea". It would be an overly-ambitious goal and very challenging to materialize.